At 7:30 pm we all met up for a meeting at turtle camp where one of the staff explained that tonight we would be looking for a “star nine” from the previous night (a turtle that laid but was unable to be identified), a turtle that had performed a dry run the night before, and two other turtles who were likely to lay again based on the date of their last lay. We broke up into two groups to split the night patrol of Sandy Point National Wildlife Rescue. After our meeting at turtle camp, Katja, Ashley, Aurora and I walked the grassy side of the beach with Kelly. As we started walking, we discovered a body pit most likely left from a leather back turtle. The tracks from the turtle were slightly confusing as they went in multiple directions before covering tracks that were previously laid. We were able to assume from the “in” and “out” tracks that although it was possible that two turtles had laid in the same vicinity, the overlapping tracks and abandoned body pit were most likely from the same turtle. We identified the two ridges that were made by her flippers and estimated where her eggs were laid. Soon after 9, we got a call from the team on the beach side that said that a hard shelled turtle has emerged from the water and that she was starting to body pit. After finishing the last leg of our patrol, we hopped in Kelly’s car and drove to the sandy side excitedly hoping that the green turtle would lay. When we arrived, the green turtle was starting to body pit. Kelly brought us up close so that we could watch as the turtle began to dig herself into the sand, using her front flippers to push sand away and her back flippers to burrow herself down. We were able to witness the power of her flippers first hand when her powerful front flippers sent sand spraying into our faces! She soon decided to switch locations and began searching the berm for a better area to lay. Around an hour later, she had dug herself a deeper body pit and had begun her egg chamber. We gathered around to watch her as she dropped eggs from her ovum two at a time into the chamber. Around forty five minutes later, she had deposited all her eggs and began disguising them, taking deep breaths and breaks every now and then to regain her energy. After about two and a half hours following her emergence from the water, she began her trek back to the sea and we watched as she pushed herself into the water and the ocean took her away. This morning, on Earth Day we got up bright and early to do a beach cleanup. 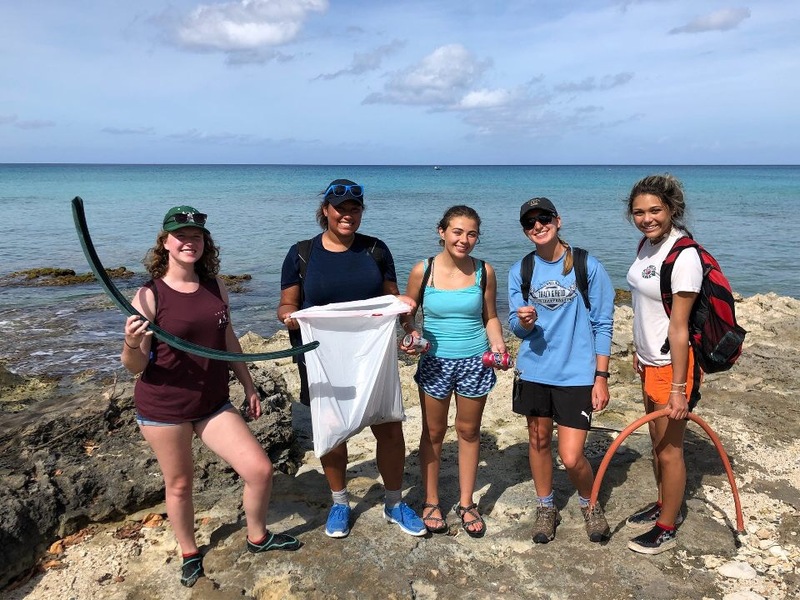 We spit up into two groups and started at the ends of Coconut and Sprat Hall beach to collect as much trash as possible from the beautiful habitat. We were able to collect debris ranging from large pieces of scrap metal, to clothes and food wrappings. After two hours, we called our cleanup a success and carried two large trash bags off the beach. When we returned to Cottages by the Sea, we had some time to rest up before we met at the pavilion to discuss tracking turtle genetics and Environmental DNA samples (DNA samples collected from water surrounding an organism). We were all intrigued as Peter Dutton discussed the differences between social facilitation and geomagnetic modeling. He also explained that natal homing is not the most adaptive behavior as it allows turtles to return to the same location even if that location may no longer be suitable for egg laying. 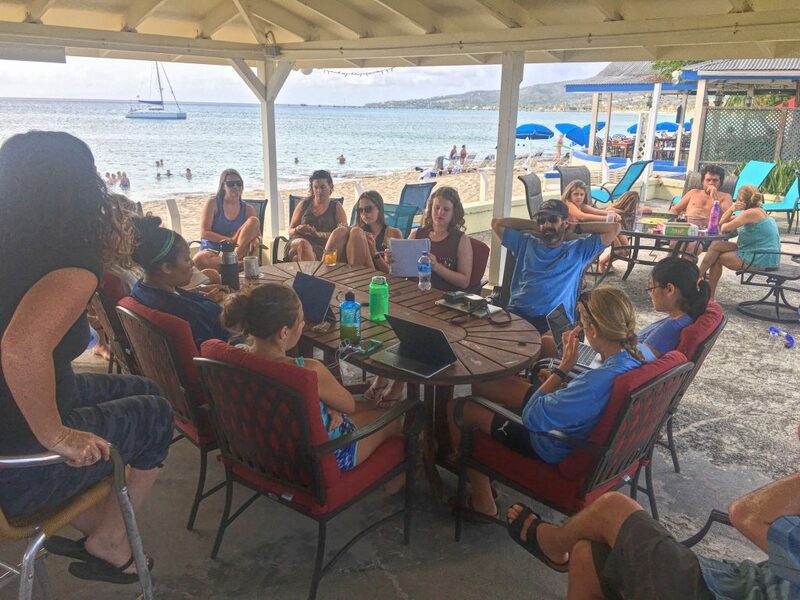 He discussed how mitochondrial DNA is passed from mother turtle to offspring and using that DNA allows researchers to track lineages and sea turtle population genetics. We then had dinner and decided to rest up before another exciting night on patrol.